For the film, see Hadewijch (film). Contours of the Duchy of Brabant of Hadewijch's time, drawn on a 20th-century map of Belgium and the Netherlands. Hadewijch (sometimes referred to as Hadewych, Hadewig, ... of Antwerp, or ... of Brabant) was a 13th-century poet and mystic, probably living in the Duchy of Brabant. Most of her extant writings are in a Brabantian form of Middle Dutch. Her writings include visions, prose letters and poetry. Hadewijch was one of the most important direct influences on John of Ruysbroeck. No details of her life are known outside the sparse indications in her own writings. Her Letters suggest that she functioned as the head of a beguine house, but that she had experienced opposition that drove her to a wandering life. This evidence, as well as her lack of reference to life in a convent, makes the nineteenth-century theory that she was a nun problematic, and it has been abandoned by modern scholars. She must have come from a wealthy family: her writing demonstrates an expansive knowledge of the literature and theological treatises of several languages, including Latin and French, as well as French courtly poetry, in a period when studying was a luxury only exceptionally granted to women. Most of Hadewijch's extant writings, none of which survived the Middle Ages as an autograph, are in a Brabantian form of Middle Dutch. Five groups of texts survive: her writings include poetry, descriptions of her visions, and prose letters. There are two groups of poetry: Poems in Stanzas (Strophische Gedichten) and Poems in Couplets (Mengeldichten). Finally there is the "Lijst der volmaakten" ("list of the perfect ones"). Her forty-five Poems in Stanzas (Strophische Gedichten, also Liederen, "Songs") are lyric poems following the forms and conventions used by the trouvères and minnesingers of her time, but in Dutch, and with the theme of worldly courtship replaced by sublimated love to God. Many of them are contrafacta of Latin and vernacular songs and hymns, leading to a Dutch edition renaming them "Liederen" ("Songs") and including audio recordings of performances. 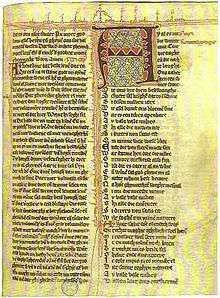 The sixteen Poems in Couplets (Mengeldichten, also Berijmde brieven, "letters on rhyme") are simpler didactical poems in letter format, composed in rhyming couplets, on Christian topics, not all of them considered authentic. Hadewijch’s Book of Visions (Visioenenboek), the earliest vernacular collection of such revelations, appears to have been composed in the 1240s. It prominently features dialogue between Hadewijch and Christ in visionary speech, an early example of this mode of vernacular religious instruction. Thirty prose letters also survive: here Hadewijch explains her views, and they give some context to her life. The "Lijst der volmaakten" (list of the perfect ones), is joined to the Visions in some manuscripts, and to the Poems in Stanzas in a more recent one. It lists several saints, like Bernard of Clairvaux, but some entries are more remarkable, like a beguine that had been condemned to death by the inquisition. Hadewijch's writings influenced Jan van Ruusbroec both as a theologian and a mystic. 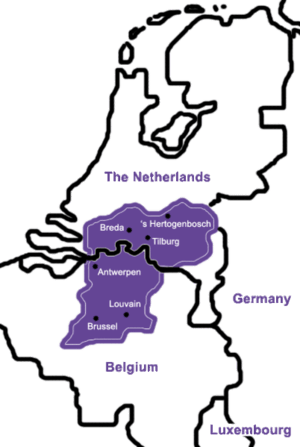 ↑ Note that in the modern state of Belgium Antwerp (the city) lies not in Brabant (the Belgian province) but in the province of Antwerp. The "of Brabant" and "of Antwerp" identifications of the 13th century Hadewijch are apparently primarily intended to distinguish her from the 12th-century German prioress Blessed Hadewych (). Part of the evidence for her origins lies in the fact that most of the manuscripts containing her work were found near Brussels. The Antwerp connection is mainly based on a later addition to one of the manuscript copies of her works, that was produced several centuries after her death. ↑ The 19th century understanding (based exclusively on her visions and poetry) that she would have been a nun, as described for instance in C.P. Serrure (ed. ), Vaderlandsch museum voor Nederduitsche letterkunde, oudheid en geschiedenis, II (C. Annoot-Braeckman, Gent 1858), pp. 136-145, was later abandoned. That she could be identified with an abbess that presumably died in Aywières (the convent where also Saint Lutgard lived around the same time) in 1248, is considered even more unlikely in recent scholarship. For more on this, see, for instance, the writings by Paul Mommaers mentioned in the references section below. ↑ Bernard McGinn, The Flowering of Mysticism, (1998), p200. ↑ Rozenski, Steven (2010), "The Promise of Eternity: Love and Poetic Form in Hadewijch's Liederen or Stanzaic Poems", Exemplaria, 22 (4), doi:10.1179/104125710X12730486676225 . ↑ Hadewijch, Liederen, edited, introduced, and translated by Veerle Fraeters & Frank Willaert, with a reconstruction of the melodies by Louis Peter Grijp (Groningen: Historische Uitgeverij, 2009). ↑ Bernard McGinn, The Flowering of Mysticism, (1998), p200., Zimbalist, Barbara (2012), "Quotation and Imitation in Hadewijch's Visioenen: the Visionary and the Vernacular Voice of Christ", Ons Geestelijk Erf, 83 (3): 216–42 . Swan, LauraThe Wisdom of the Beguines: the Forgotten Story of a Medieval Women's Movement, publisher=BlueBridge, 2014. Dailey, Patricia (2013). "Living Song: Dwelling in Hadewijch's Liederen". Promised Bodies: Time, Language, and Corporeality in Medieval Women's Mystical Texts. Columbia University Press. pp. 123–56. Fraeters, Veerle (2013). "Hadewijch of Brabant and the Beguine Movement". 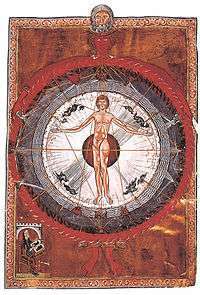 A Companion to Mysticism and Devotion in Northern Germany in the Late Middle Ages. Brill. pp. 49–72. McGinn, Bernard (1999). The Flowering of Mysticism. pp. 200–244.